Mass of Christian Burial for Beverly Dorfschmidt, 91, of Groton will be 2:00 p.m., Monday, July 23rd at St. Elizabeth Ann Seton Catholic Church, Groton. Father Mike Kelly will officiate. Burial will follow in Union Cemetery under the direction of Paetznick-Garness Funeral Chapel, Groton. Visitation will be held at the church on Sunday from 2-4 p.m. and for one hour prior to services on Monday. Bev passed away Wednesday, July 18, 2018 at Avera Mother Joseph Manor, Aberdeen. Beverly Jean was born in Watertown on June 8, 1927 to James and Frances (Downs) Haight. 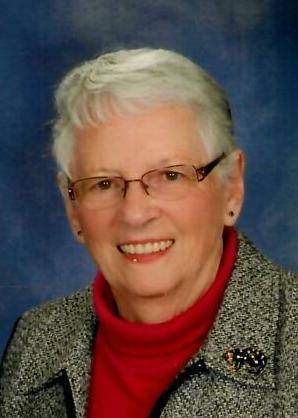 Bev graduated from Watertown High School in 1946 and continued her education at Northern College. She obtained her teaching degree and taught school in Groton. On July 21, 1952, she was united in marriage with Harvey Dorfschmidt in Watertown and they were blessed with three children. They made their home in Groton for over 60 years. Bev was a member of St. Elizabeth Ann Seton Catholic Church and had been active in the Altar Society. She also belonged to the American Legion Auxiliary and Wednesday morning coffee group. She and Harvey enjoyed traveling and spending winters in Pharr, Texas for many years. Beverly’s hobbies included reading, golf and making dolls. Her grandkids also enjoyed her brownies and baked beans. Celebrating her life are her children; Deb Woodworth of Aberdeen, Dan (Julie) Dorfschmidt of Mandan, ND, Jim (DeeAnn) Dorfschmidt of Spearfish, 6 grandchildren: Sarah (Matt) Brust, Tom (Raleigh) Woodworth, Chris (Kate) Dorfschmidt, Andrew Dorfschmidt, Katy Dorfschmidt, Matt Dorfschmidt, 5 great-grandchildren: Peyton, Cole and Cooper Brust, Davis and Harvey Dorfschmidt, her brother, Pat Haight of Nashville, TN and many nieces and nephews. Preceding her in death were her parents, her husband in 2012, one sister, two brothers and two sister-in-laws. Honorary Casketbearers will be her Great-Grandchildren. Caskebeares will be her Grandchildren.